Adding a wash of colour to a simple scribble is the first step in painting -and this book shows how to exploit this technique, using most media at any artist's disposal. Exercises and step-by-step compositions show how successful results can be easily achieved across a range of subjects to suit every taste. Even those who already paint will discover new ideas to help them develop their painting abilities further, whether it is in investigating other media such as watercolours, oils, acrylics, pastels, inks and gouache, or in manipulating familiar painting tools in a completely different way. 112 page hardback books for would-be and existing painters containing Paul Taggart's unique Artstrips. 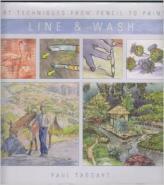 Based on techniques, this series of books takes readers through the natural progression from drawing to painting and shows the common effects that can be achieved by each of the principal media, using a variety of techniques. Each book features six principal sections comprising exercises and tutorials worked in the principal media. Supportive sections on materials and tips, plus colour mixing complete these workshop-style books.